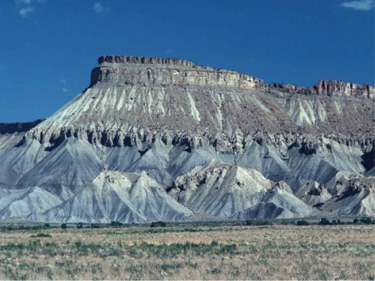 When the Colorado River and its tributaries flow through the Colorado Plateau, which is dominated by sedimentary rocks formed in a marine environment, the increased concentration of salt degrades the water quality of the river dramatically. Saline springs flow directly into the Roaring Fork, the Dolores, Cataract Canyon, and the Little Colorado River. The situation is compounded even further by all the reservoir evaporation in these desert climes, especially in Lake Powell and Lake Mead. By the time it gets to end-users like San Diego and Tucson, the water is typically blended with alternative water sources to lower the concentration of total dissolved solids. 2003 - Progress Report. Department of the Interior. 1978 - Paradox Valley Unit: Definite Plan Report. Reclamation. 1979 - Environmental Impact Statement. Reclamation. 1985 - Economic Review of Salinity Control Program. Gardner et al. 1986 - Evaporation data for Lake Powell. Reclamation. Salinity Control Story UCRB. Danzer. History of the Salinity Control Project. Reclamation.